As federal and state lawmakers continue to search for solutions to fund and finance critically needed transportation infrastructure, HNTB Corporation’s latest America THINKS national public opinion survey finds Americans with definitive views on how that funding should be generated and who should be responsible for maintaining and building the nation’s transportation network. “Americans value mobility and are willing to pay more to maintain and grow transportation infrastructure, especially if they know how their money will be used,” said Kevin Hoeflich, PE, HNTB toll services chairman and senior vice president. The HNTB survey also found nearly three in four Americans (73 percent) support public-private partnerships as a way to maintain existing and build new transportation infrastructure. Fifty-two percent believe the responsibility for funding maintenance and building new transportation infrastructure should be shared by the government and private sector. The desire to avoid congestion and save time is behind the willingness of almost six in 10 Americans (59 percent) to pay a toll, even when a free alternative is available, according to the HNTB survey. Of these respondents, 57 percent are willing to pay an average of $1.70 to use a priced managed lane, also called express lanes, if that would save 15-30 minutes of time, avoid congestion and provide a predictable travel time. 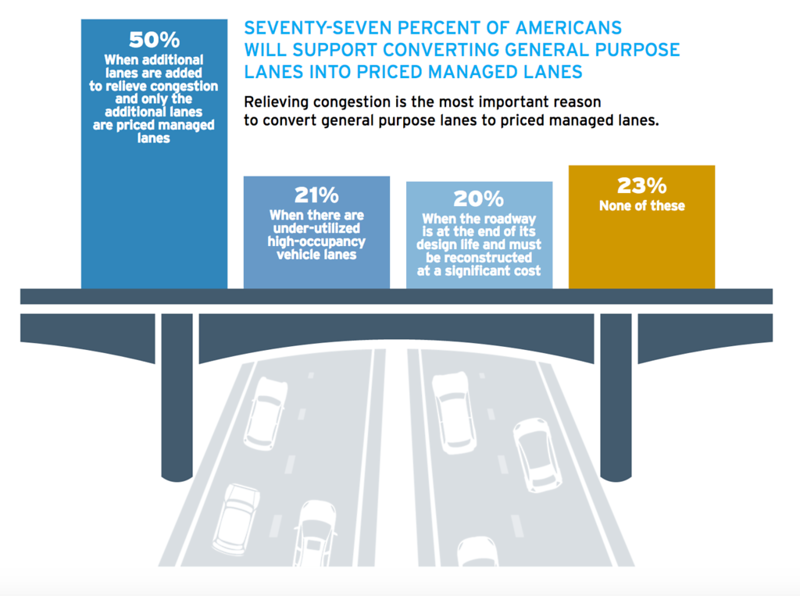 The conversion of general purpose interstate lanes to priced managed lanes is supported by 77 percent of survey respondents. Among this group, 50 percent believe reducing congestion is the most important reason for this conversion, an increase from 43 percent from the same question asked in a 2016 HNTB survey. HNTB’s survey found eight in 10 Americans (80 percent) support adding tolls to existing highways and interstates. When asked how those toll revenues should be used, reducing congestion was cited by 41 percent of respondents; improving safety, 40 percent; adding vehicle capacity, 34 percent; and adding transit capacity, 21 percent. 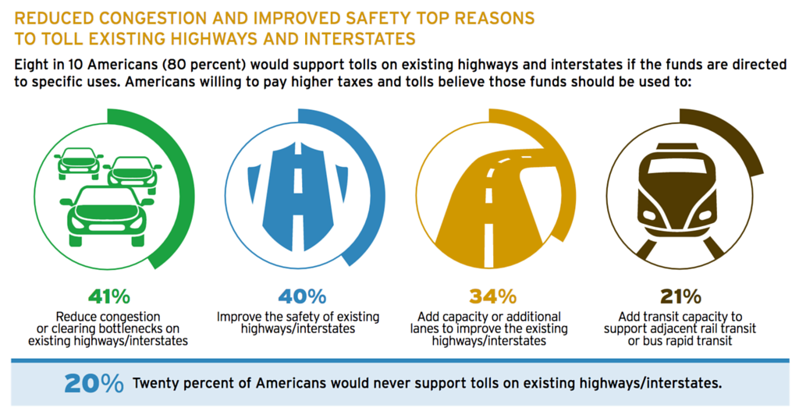 Twenty percent of respondents would never support tolls on existing highways/interstates. The survey also found two-thirds of respondents (66 percent) support tolls to fund critical infrastructure projects if there are insufficient funds from other sources. The concept of reduced toll rates for low-income users is supported by more than three in four Americans (76 percent). “Most importantly, there is growing recognition of tolls as a source of revenue that can help fund decades of neglect of maintenance and operations, system improvements and other critical transportation needs,” said Hoeflich. About the survey HNTB’s America THINKS “Paying for Infrastructure - 2017” survey polled a random nationwide sample of 1,027 Americans, ages 18 and older, between July 14 and July 16, 2017. It was conducted by Russell Research, using an email invitation and online survey. Quotas were set to ensure reliable representation of the entire U.S. population ages 18 and over. The margin of error is +/- 3.1 percent.